While F-35 production ramps up, American and European research and development efforts have turned to a next generation of air supremacy aircraft with capabilities superior to fifth-generation combat aircraft. 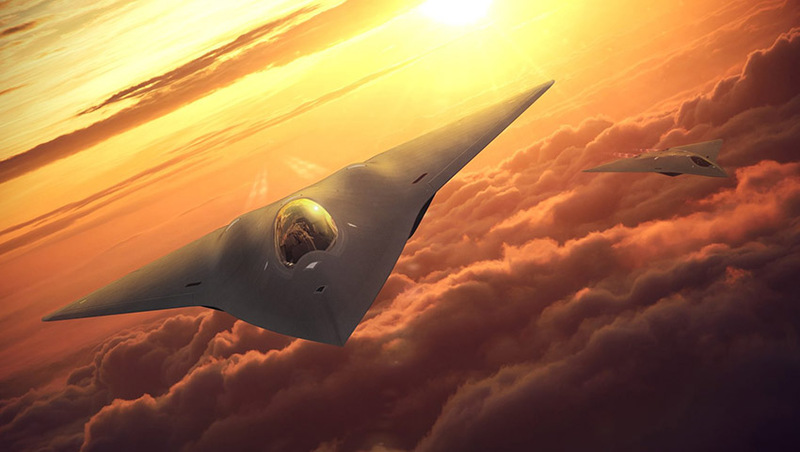 Next-generation air supremacy aims to incorporate enhanced stealth, speed and direct energy weapons to act as a force multiplier in the 21st century. With the growing success of Russian and Chinese fifth-generation fighter aircraft like the Su-57, J-20 and JF-31, the US has kicked off a suite of development programs to replace the ageing F-15 Eagle and fifth-generation F-22 Raptor air frames beginning in the 2030s. While the US has plans to maintain fifth-generation combat aircraft like the F-22 and the F-35 and has recently announced the acquisition of an advanced F-15X variant, which will serve as the backbone of the US continental air national guard wings, the rapid evolution of potential adversaries' fifth-generation air combat capabilities has forced a major step-change in the way the US responds to these evolving capabilities. The US is not the only nation concerned about the modernisation and development programs, as both British and a Franco-German team are seeking to respond to the qualitative and quantitative capabilities transforming not only the Russian and Chinese air forces but also the potential proliferation of fifth-generation technologies to potentially hostile middle and great regional powers, challenging the linchpin of Western military dominance: air superiority. The 2016 'Air Superiority 2030' study conducted by the US Air Force sought to identify the capabilities of the 'Next Generation Tactical Aircraft' air superiority/dominance fighter jet expected to enter service in the 2030s. As part of this identification process, the US Air Force identified a suite of capabilities needed to survive in the increasingly complex future air combat environment. "The future system will have to counter adversaries equipped with next-generation advanced electronic attack, sophisticated integrated air defence systems (IADS), passive detection, integrated self-protection, directed energy weapons, and cyber attack capabilities. It must be able to operate in the anti-access/area-denial (A2AD) environment that will exist in the 2030-2050 time frame," the US Air Force solicitation stated. The US Navy has also recognised a number of major capability gaps in both the F-35C and the F/A-18E/F and G series Super Hornet and Growler strike aircraft, namely the lack of low observable coatings, limiting survivability in complex integrated air defence environments and comparatively short, unrefuelled combat radius' exposing the US Navy's aircraft carriers to advanced Russian and Chinese anti-ship cruise and ballistic missiles. As a result of the different operating environments and requirements, the Pentagon, Air Force and Navy would be expected to avoid the joint development program model, which, while delivering the F-35 Joint Strike Fighter, presented a series of challenges resulting in compromised capabilities. Building on the success of the Eurofighter Typhoon, developed in conjunction with Germany, Italy and Spain, and now in operation with air forces throughout Europe and the Middle East, the UK government, Ministry of Defence, RAF and BAE have combined the lessons learned throughout the research and development, procurement and operational phases of the Typhoon project to prepare the nation and industry for the next generation of air combat capability. All of the partners agree that a future combat air system must be able to survive the most challenging combat environments, meaning that payload-range, speed and manoeuvrability will be key to operational success. Developments in directed energy weapons systems will also provide for self-defence and use within visual range aerial combat, while the ability to deploy and manage swarms of air launched UAVs will provide an unprecedented lethality and response to A2AD strategies currently employed by potential adversaries. Command and control of other systems, such as UAVs, will be enabled from a fully customisable virtual cockpit, with advanced human-machine interfaces, including eye tracking and gesture based controls, offering intuitive and sophisticated mission management. The joint Franco-German Future Combat Air System (FCAS) is expected to enter into service by 2040 and has been designed to be more than a combat aircraft. The FCAS is expected to serve as part of a system of systems, consolidating an array of interconnected and interoperable elements, including unmanned medium altitude, long endurance (MALE) drones, the existing fleet of Eurofighter and Rafale fighter aircraft, cruise missiles and drone swarms. The FCAS system will serve as a critical component of a connected and interoperable system with a vast perimeter of specialist mission aircraft, satellites, NATO systems and a distributed network of land and naval combat systems. FCAS is designed to assure European autonomy in the air and space domain, while enhancing existing political, strategic and industrial partnerships in Europe, following the success of the Eurofighter Typhoon program, which combined the industrial efforts and capabilities of the UK, Germany, Spain and Italy. Meanwhile, the joint French-German Airbus Defence FCAS will see a twin-engine, twin tail, dual pilot aircraft to be operational between 2030 and 2040. The European design will also include a focus on incorporating a command and control for 'swarm' drone operations and will, like the UK Tempest, support the Eurofighter Typhoons in operation with the German Air Force, Rafale in operation with the French Air Force and replacing the Panavia Tornado in the strike role. For Australia, the future operating environment to the nation's immediate north will necessitate investment in a highly capable, long-range, air dominance fighter aircraft to compliment the F-35 Joint Strike Fighters and replace the ageing F/A-18 E/F Super Hornets, by the mid 2030s. Australia's industrial capability and value adding capacity as developed throughout the F-35 program places Australia in an ideal position to integrate and participate in the development of any number of sixth-generation fighter designs to ensure continued air combat capability and interoperability with key regional and global allies in increasingly contested environments, beyond 2030.